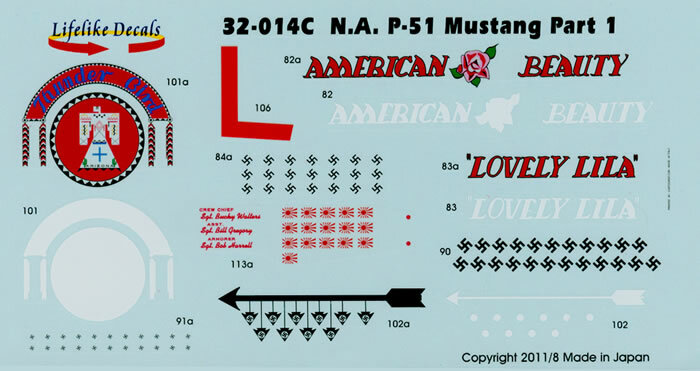 It seems that the new Tamiya 1/32 scale P-51D has spurred decal makers into releasing a rush of new decals onto the market. 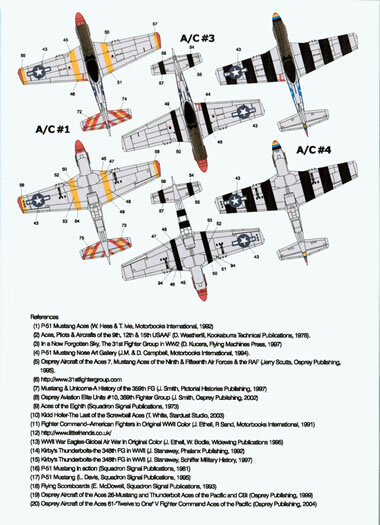 The Japan-based Lifelike Decals is one of those companies and this new release from them is an upsized version of their 1/48 scale sheet (48-015). The sheet provides markings for four machines that operated in three different theatres in the final years of WWII. P-51D-15-NA 44-15459 "AMERICAN BEAUTY" flown by Captain John Voll of the 308th Fighter Squadron, 31st Fighter Group when it was based at San Servo, Italy in late November of 1944. 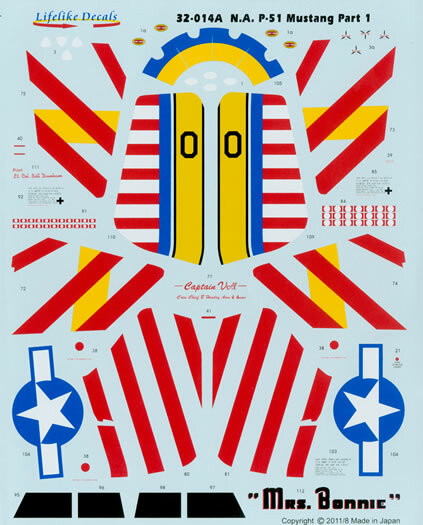 The aircraft is in basic natural metal finish with an olive drab anti-glare panel and is colourfully marked indeed with a red nose and spinner, diagonal red stripes to her vertical and horizontal stabilisers and yellow theatre bands on her wings and horizontal stabiliser. Thankfully, you have been saved from a lot of masking as all of the yellow bands are supplied as decals as are the red stripes for her tail feathers. P-51D-10-NA 44-14733 "Daddy's Girl" flown by Captain Raymond Wetmore of the 370th Fighter Squadron, 359th Fighter Group, at East Wretham, in the UK between February and March of 1945. The machine is in basic natural metal finish with black theatre bands on her vertical stabiliser/rudder, horizontal stabilisers and wings (supplied as decals) as well as an olive drab anti-glare panel. Belonging to the 359th Fighter Group, she wears their green nose group marking as well as the 370th Fighter Squadron's blue rudder. P-51D-10NA 44-14570 "Thunder Bird" of the 335th Fighter Squadron, 4th Fighter Group, Debden, UK between September and November 1944. Natural metal finish/olive drab anti-glare panel again with black theatre bands and the 4th Fighter Group's red nose group marking and the remains of the 6th of June 'D' Day black and white markings to her lower fuselage. A Pacific-based machine rounds out the sheet. 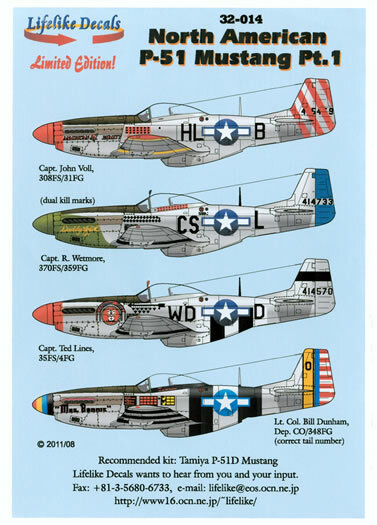 P-51K-10 44-12017 "Mrs Bonnie" flown by Lieutenant Colonel Bill "Bull" Dunham, at that time, the Deputy Commander of the 348th Fighter Group, Le Shima/Okinawa in August of 1945. Finish is the basic overall natural metal/olive drab anti-glare panel. Another colourful bird, she wears the Pacific Theatre's thick black bands to her wings and fuselage (you are on your own here as the bands are not supplied as decals which, when you think of it is sensible as the bands are pretty big and would be a nightmare to apply) as well as a red and white striped rudder and yellow vertical stripe to her fin (341st Fighter Squadron marking) (supplied as a one-part decal). Her spinner is finished with a red tip, and yellow, blue and black bands representing the colours of each of the four squadrons that made up the Group. Having struggled in trying to paint bands on spinners in the past, I was happy to see that Lifelike has supplied the bands as a one-piece decal (less the black one). A pair of faded fuselage national insignia is provided too but they look a tad too faded for my liking!). If you are lucky enough to have the Ethel and Bodie book "War Eagles in Original Colour", it features a beautiful colour photograph of this machine on page 12. A hallmark of Lifelike Decals is the comprehensive research they undertake in producing their decals. This sheet is no exception and lists no less than 20 different references they have consulted in bringing it to fruition. The resulting research is documented on the placement guide and where there is any controversy or doubt as to what markings were worn on the one-to-one-scale machines; a full explanation as to why they chose to depict the marking as they have is given. The placement guide itself is A-4 in size, printed on heavy weight paper and comprises three sheets. It provides left hand side profiles for each option as well as a scrap view of the right hand side of the nose of the first option and a close-up of the nose marking of the third option. Also included is the descriptions/history of each option on the centre pages and appropriate upper and lower surface views on the back page (with the exception of the second option!) 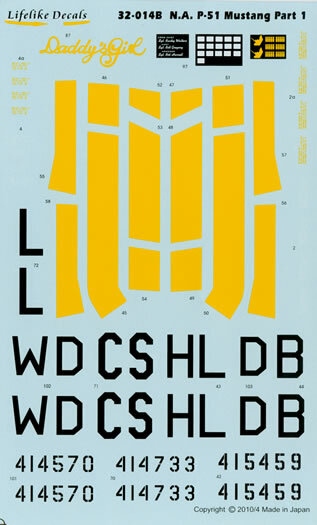 The third sheet is also included and it carries the placement guide for the stencil data. There are four sheets provided in this issue. The two larger ones carry the vast majority of the markings whilst the smaller ones carries a single set of national insignia, black theatre bands (European Theatre options only), squadron and plane in squadron code letters and comprehensive stencil data. 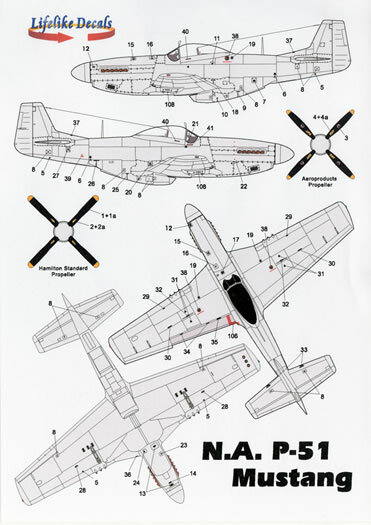 Amongst this stencil data, is a separate and correct data block for each option as well as both Aero Products and Hamilton Standard propeller logos. There is no advice as who printed the decals however, they are thin, have a minimum of film surrounding each subject and are in perfect register. 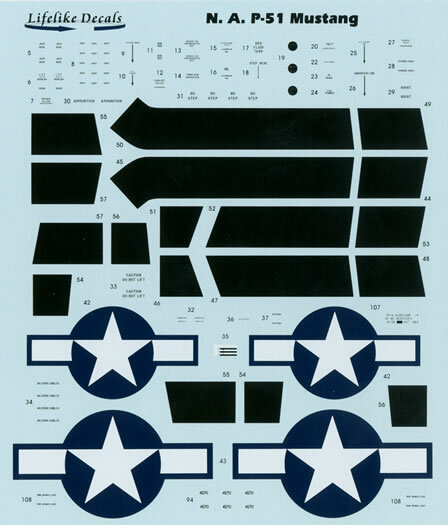 Where it was likely that there was going to be problem with register, Lifelike has provided two-part decals, examples of these include the black surrounds to the names of the first option, and the black portions of the nose art for the third option. The placement guide and the four decal sheets come packed in a clear plastic zip-loc bag. 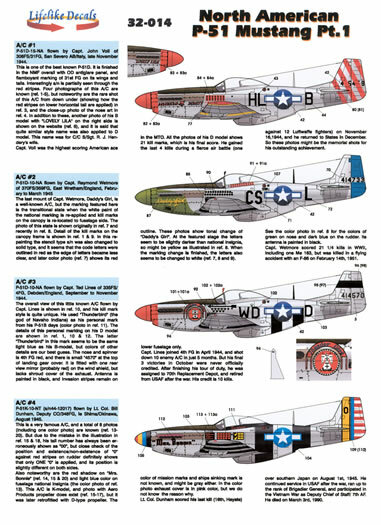 Given that this is a “Part 1” they have more P-51 sheets in the pipeline!